Saute the diced onion with 2 Tbsp of olive oil in a medium pot over medium high/heat. When the onion is soft and translucent, add 1 cup of long grain rice. Continue to cook and stir for 2-3 minutes more or until the rice looks transparent. Sauteing the uncooked rice will slightly toast it and add more flavor. Add 2 cups of chicken broth, bring to a boil then reduce the heat to low and simmer for 40 minutes (with a lid). Meanwhile, preheat your oven to 350 degrees. Thaw the broccoli florets in the microwave according to the package directions (in a microwave safe dish with an inch of water). Only cook/thaw the broccoli until it is bright green and only slightly tender. You do not want to cook it to the soft/mushy point because it will cook further in the oven once it is mixed into the casserole. Drain off any liquid from the broccoli. Mix in the cream of chicken soup (or you can use cream of mushroom, cream of celery, cream of anything you’d like). Add the freshly ground black pepper and cayenne powder (if you want a kick). Once the rice has finished cooking, combine that with the broccoli and soup mixture. Add ½ cup of shredded cheese and transfer the mixture to a casserole dish (I actually just mixed all of the ingredients in that dish to begin with). 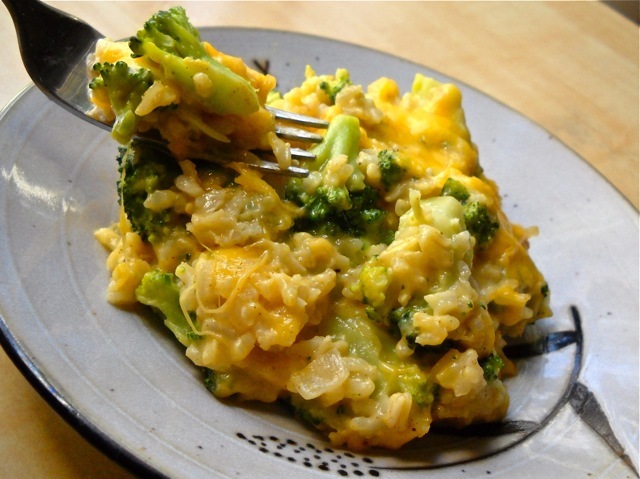 Top with the remaining ¼ cup of shredded cheese and bake for 30 minute. Serve the hot, warm, gooey casserole and feel all of your troubles melt away! NOTE: If you prefer fresh broccoli or get it on sale, it is almost as easy to use as the frozen kind. Just cut the florets off. The stem is actually quite tasty and healthful too, it just needs to be peeled, cut smaller and cooked longer because it is tough. Then you can steam the broccoli in the microwave just like you would to thaw the frozen kind. Put it in a dish with about an inch of water, cover it with a microwave safe lid (but don’t clamp it down, leave room for the steam to escape a little) and microwave until it is just tender. Proceed with the recipe as usual!